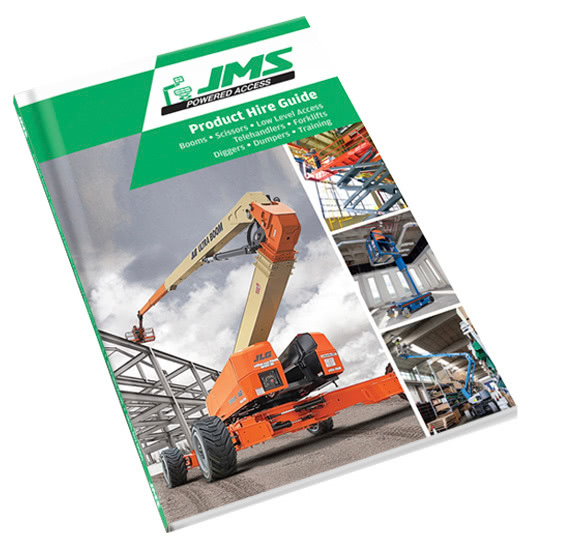 JMS has added the Haulotte HA16 RTJ Pro diesel boom lift to its powered access fleet. It is a great all-round access boom, but has been designed, says Haulotte, for use in the construction sector, in particular. “We are responding to strong demand from customers for productive machines.” says Mark Jackson, Managing Director of JMS. When operating aerial platforms on construction sites, safety is obviously of paramount concern. Providing access equipment that operatives like to use, and which enhances their well being, is also an increasingly important consideration in the construction industry – as it supports productivity and employee retention. 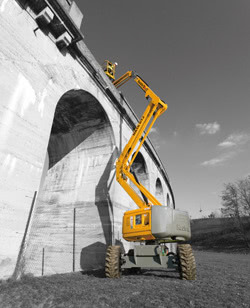 The Haulotte HA16 RTJ Pro has excellent horizontal outreach with a maximum working height of 16 metres. With its leading ability to cope with rough and uneven terrain, and some clever design features to support the construction process, ticks these boxes. The single joystick allows the operator to hold on to the safety rail if necessary,to prevent slips and bumps over uneven ground. Excellent all-round visibility helps the boom’s operator stay alert to all potential hazards. The boom’s rigid design reduces boom flexing and basket sway, giving operators a safe and smooth drive. Four-wheel steering and an oscillating axle allows sure and precise movement of the boom lift across the ground. The HA16 RTJ Pro is also fitted with the Activ Shield Bar, an active anti-crush device that protects the operator and alerts operatives on the ground if there is a potential trapping incident. Haulotte claims the HA16 RTJ Pro has the best horizontal outreach on the market, giving operators easier access to work locations in complex sites. An articulating job aids precise location of the basket. Also, the basket can be elevated to its full height of sixteen metres in just forty seconds. This is one of a number of features that combine to make this diesel boom highly productive, especially in construction environments where materials need to be regularly replenished. There is also a built-in tool tray, so a selection of tools can be kept close to hand. The boom lift has been designed to deliver smoother performance with fewer vibrations, and less noise. Haulotte says the advanced variable-speed engine makes the machines twice as quiet as the model it is replacing. This adds to operator comfort, reducing the risk of fatigue which could undermine safety and productivity. It also makes the Haulotte HA16 RTJ Pro ideal for low -noise, high-precision working environments, or where there is a need not to disturb other people, for example nearby residents. Controlling cost, while not compromising safety and operational effectiveness, is a strong focus for many projects. The Haulotte HA16 RTJ Pro diesel boom lift reduces fuel consumption by 15 per cent, and emissions, reducing its operator’s carbon footprint. Its robust design minimises the risk of breakdowns, even when used across rough terrain. If repairs are needed, its modular design reduces downtime. “At JMS, every one of our booms across the fleet have anti-entrapment devices, as a standard.”says Mark Jackson, Managing Director of JMS. The Haulotte HA16 RTJ Pro diesel boom lift is an excellent hire choice for a range of working at height applications, not just construction. These include facilities maintenance, site inspection and surveying, art installation, demolition preparation, landscaping and tree surgery. JMS is a national access hire service, with depots in Harpenden, Hertfordshire, and Leeds, West Yorkshire.